A new officially licensed Sonic the Hedgehog board game has just hit Kickstarter, titled Sonic the Hedgehog: Battle Racers. Developed by Shinobi 7, the board game sees 2-5 players using re-painted miniatures to race past Badniks and bosses, while collecting rings in a sprint to the finish. While the game will see a commercial release outside of Kickstarter, there are bonuses to entice collectors. The bonuses, however, come at a cost as the only tier is $100 + shipping. 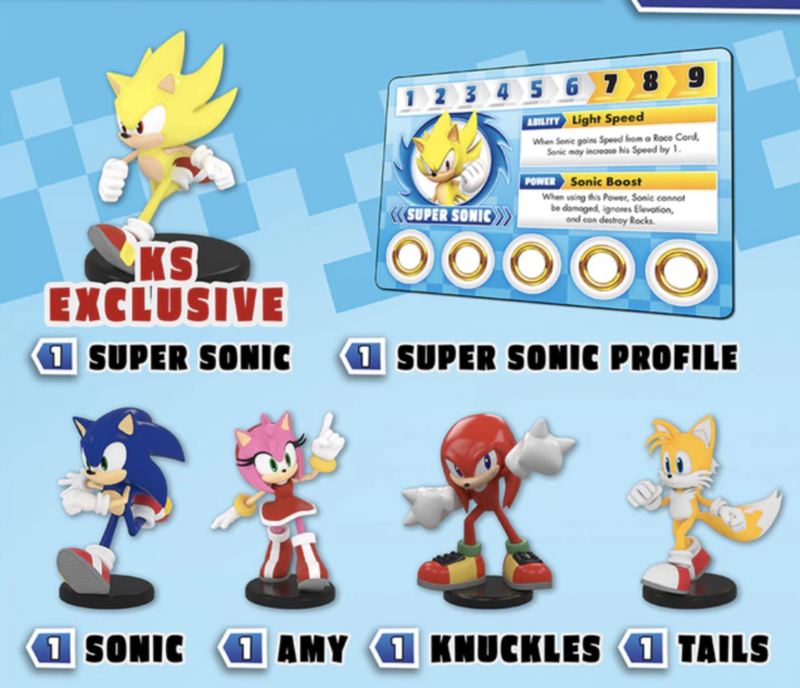 Backers will receive the base game which includes figures of Sonic, Tails, Amy, Knuckles and Eggman, profile cards, agility cards, boss cards, track sections, tokens, reference cards, an exclusive Super Sonic figure, 40 exclusive badnik miniatures featuring buzz bombers, crabmeat, moto bugs and spinners and all unlocked stretch goals. It will be interesting to chart the progress of this campaign, as some might balk at the price point. Personally, it seems like a fairly reasonable price given the price point of other miniature based board games I’ve seen in the past. If you pass on this, there will always be a lower priced retail version, though you miss out on some bonuses but the game plays the same. Learn more by checking out the official Kickstarter page. Sonic the Hedgehog: Battle Racers Board Game hitting Kickstarter this February Upcoming Sonic merch – History of Sonic Collector’s Edition and SEGA teams with Sambro to create board games and puzzles Sonic and SEGA print collections from Iron Gut Publishing announced for the UK, art event revealed SEGA Astro City arcade machine model from Wave now available for pre-order IDW reveals cover art for Sonic The Hedgehog #1, revealing the return of artist Tracy Yardley! Shipping is NOT included in the cost of this pledge. See “Shipping” for details. Also, ALL stretch goals met are now Freebies. I’d argue that the top tier is quite a steal if all of the stretch goals are met. All of the level expansions, and most of the additional playable characters. Heck yes!